The oil reservoir brines are very common geological fluids coexisting with hydrocarbons. The chemistry of brines is a powerful tool for determining the brine evolution and its origin, constraining fluid flow at the basin and predicting reservoir scales. This study targeted the Zubair brines in seven oilfields and investigated the geochemical evolution of brine compositions. The composition of the Zubair brine is characterized by the high average of TDS (219,408 mg/l). The contribution of cations as epm% are Na (73.7), Ca (17.32), Mg (7.45), and K (1.27), while anions contribute as Cl (99.6), SO4 (0.23), HCO3 (0.08), and CO3 (0.005). The Zubair brines are of Na–Ca–chloride type, whereas sodium content is 6.3 times greater than seawater; Ca and Mg contents are thirty-four and three times greater, respectively, while Cl is seven times greater. The SO4 ion is depleted to 0.16, due to a biodegradation. The salinity of the Zubair brine is six times more than that of seawater. The Zubair brines are characterized by an acidic pH (5.24–5.68) with a specific gravity of 1.1436, hydrocarbon saturation in pore spaces of 39%, and water saturation of 61%. 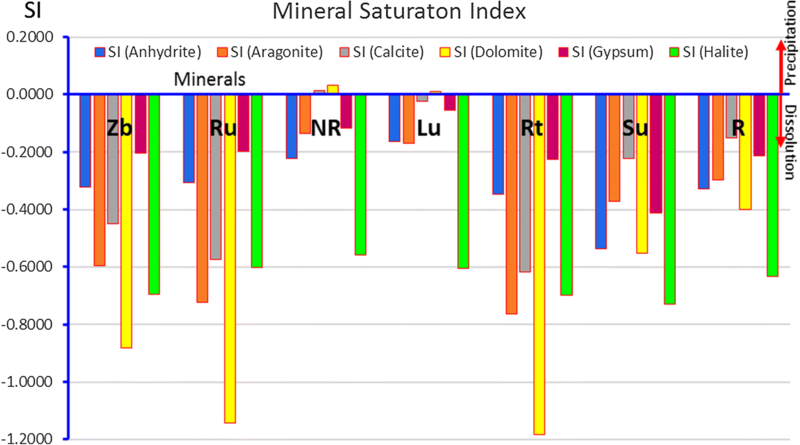 The mineral saturation model indicates that Zubair brines are unsaturated. The predicted hypothetical salts are NaCl (76%), CaCl2 (15%), and MgCl2 (7.5%). The salts Ca(HCO3)2, CaSO4, and KCl together form only 1.6%. The Zubair brines are characterized by Cl/Br (305) in average, greater than that of seawater (289) confirming the fluids (brines and hydrocarbons) migrated upwards from Sargelu Formation to Zubair reservoir through fractures and cracks in Gotnia Formation. 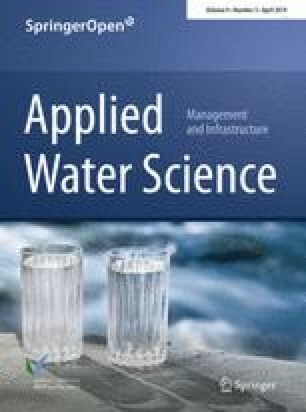 This study was conducted on the oilfield waters of the Zubair reservoir in seven oilfields in southern Iraq. Zubair Formation (Barremian–Hauterivian) is considered as an important formation in Iraq (Buday and Jassim 1980), which is the most productive oil reservoir. It is prevalently composed of terrigenous clastic as alternative layers from dominant sandstone succession with some shale and oil in the southern Iraqi fields (Aqrawi et al. 2010) and an important huge siliciclastic reservoir (Ibrahim 2001). 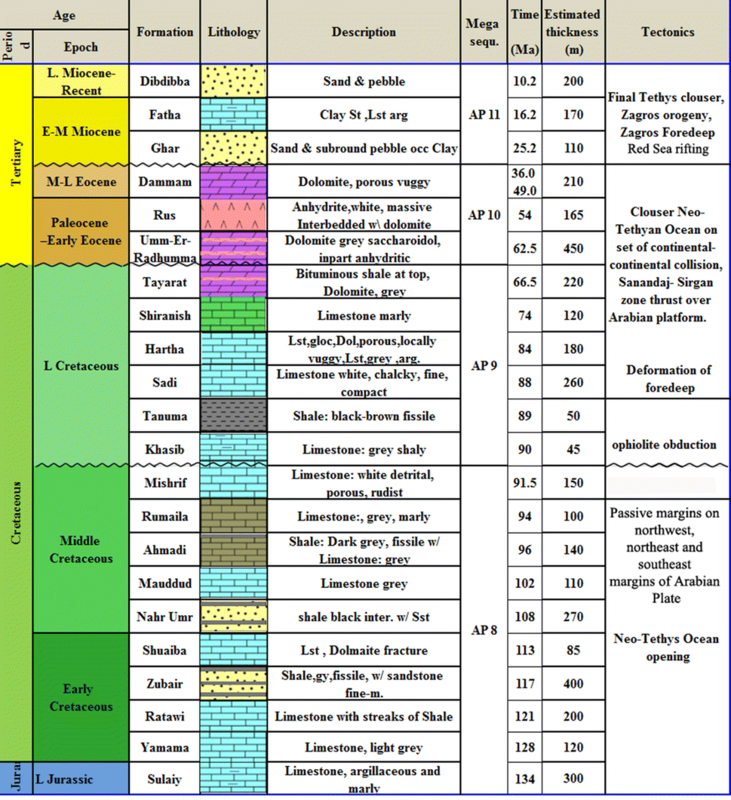 It is considered as a fair potential source rock based on 0.2–2.6 wt% TOC in the shale layers, where the major source of kerogen in the Zubair reservoir is a result of migration and accumulation from the Jurassic–Lower Cretaceous source rocks to different Cretaceous reservoir traps (Al-Ameri et al. 2011). The Zubair oilfield water is of marine origin and has been increasingly salted by interaction with the reservoir rocks (Awadh 2018). Oilfield water is brine that occurs naturally within the pores of reservoir sedimentary rock associated with the oil and gas and is free to move under appropriate hydrodynamic conditions. Oilfield waters have not received much interest, as the studies have focused on the crude oil in terms of organic geochemistry and petroleum system. Thus, the role of the Zubair oilfield water in the oil production is negligible. The physico-chemical properties of the oilfield waters impact petrophysical properties of reservoir. The chemistry of oilfield brines can help to predict pressure distribution and then determine the best-drilling sites for future exploration (Awadh 2018; Awadh et al. 2018). The fluid flow direction which is an essential parameter for hydrocarbons can be suggested by hydrochemistry (Brouwer and Jansen 2004). When the concentration of Cl reaches 180,000 ppm, the halite is precipitated but the Br partitions and holds in the solution (Walter et al. 2015), so the halite is relatively depleted in Br. The Cl/Br ratio in the oilfield brines can be used as a function of brine origin whether it is of marine origin or mixed with dissolved evaporite water. It is inferring the geochemical provenance of different groundwaters (Freeman 2007). This study is going to describe the physico-chemical characteristics of the Zubair oilfield brines, determine the distribution of salinity and its origin, estimate the brine equilibrium state and hypothetical salts. The study area is located in Basrah, southern Iraq (Fig. 1). It is relatively of flat terrain with a gradient of less than 10 cm per kilometer. Tectonically, it is located in the southern part of the near platform flank of Mesopotamian foredeep (Aqrawi et al. 2010), within the Zubair subzone which is a part of the Stable Shelf (Jassim and Goff 2006). The oilfields studied have N-S trending folds in the Mesopotamian basin. 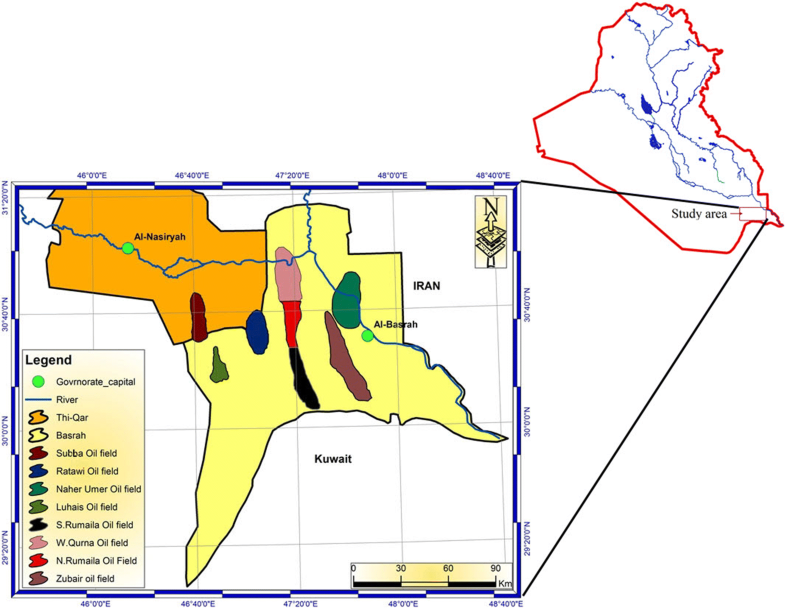 The present research deals with salinity of the Ratawi (Rt), Luhais (Lu), Suba (Su), Rumaila North (R), Rumaila South (Ru), Zubair (Zb) and Nahr Umer (NR) oilfields within Zubair reservoir (Fig. 1). The Zubair Formation is equivalent to Gadvan Formation in Iran and to Biyadh Formation in the Saudi Arabia and to Zubair in Kuwait (AL-Husseini 1997). The Zubair (Barremian–Early Albian) (Al-Ameri et al. 2011) is 301–381 m thick in southern Iraq (Ali and Nasser 1989). In the south of Iraq and Kuwait, it is overlain by the Aptian Shuaiba limestone Formation and is underlain by the Valanginian-Hauterivian Ratawi Limestone Formation; both formation contacts are gradational and conformable (Jassim and Goff 2006). In some parts of the Salman Zone, it overlies unconformably the Sullay Formation (Buday and Jassim 1980). The Zubair Formation is considered as a prograding delta (Ziegler 2001). After the uplifting in the west, deltaic sediments derived from the erosion of the Arabian Shield and the stable shelf (Al-Sharhan and Nairn 1997). The uplifting results from the Late Kimmerian movement (Al-Fares et al. 1998) and thermal doming and rifting eastern Africa (Giraud and Maurin 1992). The deposition is contemporaneous with the opening Neo-Tethys Ocean in the east of Arabian plate in the Early Cretaceous. It is composed of flovio-deltaic, deltaic and huge amount of marine sandstones (Aqrawi et al. 2010). The Zubair Formation is divided mainly into five lithological units in southern Iraq (Jasim et al. 2006) representing the succession sandstone and shale (Van Bellen et al. 1959). 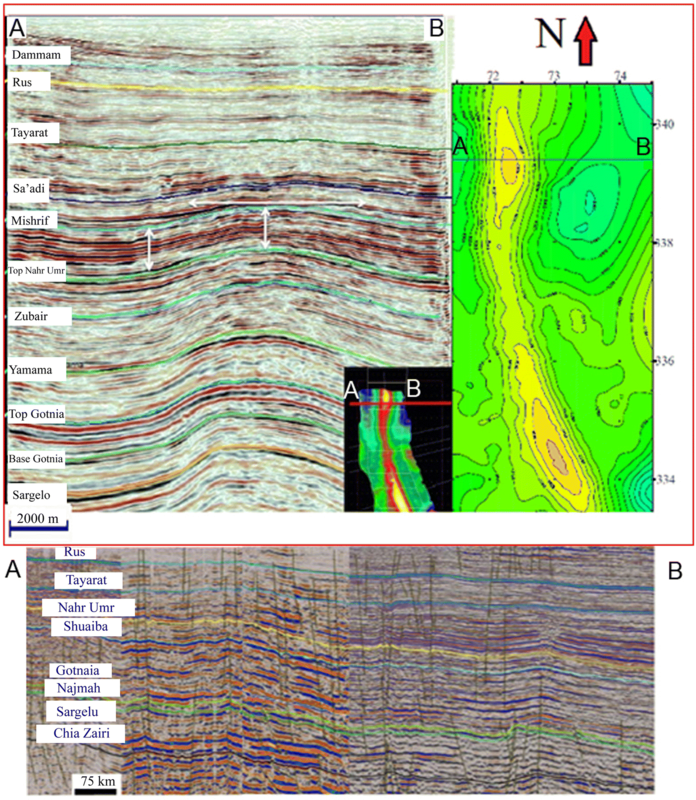 The shale layer in Zubair Formation is a primary seal that envelops the reservoir (Sharland et al. 2001). In southern Iraq, the Zubair Formation overlies the Jurassic–Early Cretaceous formations, which include Sargelu, Najmah, Gotnia, Sulaiy Yamama and Ratawi (Aqrawi et al. 2010) (Fig. 2). All concentrations of cation and anion unit are in epm%, TDS in gm/l. The concentrations (epm) less than 15% were ignored. In this regard, Adams et al. (2001) pointed to the importance of identifying water quality in the knowledge of hydrochemical processes in the course of water movement. The version 1 of AquaSal Chem (Awadh 2012) software program was used for computing the hydrochemical formula and described the water type. Geochemistry softwares AqQA and RockWorks17 are used for the identification of water class by Piper, Schoeller and Stiff diagrams. The mineral saturated index and mineral precipitation model was simulated using the PHREEQC software. The hypothetical salts that may be precipitated from the Zubair brines were calculated based on Collins (1975). The statistical hydrochemical results of Zubair brines are given in Table 1. The Zubair oilfield waters have TDS exceeding 200 000 ppm in average dominated by Na and Cl ions. The Na, Ca and Cl ions compose of more than 97% of the total TDS, where ions descended as Na+ > Ca2+ > Mg2+ > K+ and Cl– > SO42− > HCO3−. The Na content is six times greater than seawater and varies within a range restricted between 71,340 and 64,295 ppm in Rt and Lu oilfields, respectively. It makes up over 77% by mass of the cations in the Zubair oilfield water. The Na availability in the oilfields is attributed to the long-term water trapping period and sodium solubility. Faure (1986) pointed out that the high sodium content in the brines related to its high mobility in the hydrosphere. The Ca content is thirty times greater than seawater varying within a range restricted between 11,786 and 14,436 ppm in NR and R oilfields, respectively. The availability of Ca is a function of reservoir dissolution, and calcium carbonate scale may be formed when being oversaturated, where it is a most common scale found in plugged oilfield reservoirs (Collins 1975). The lack of Mg in brine is linked directly with the dolomitization (Fleischer 1962). A twice Mg as much as seawater was found, where it ranges between 2854 and 4475 ppm in NR and Rt oilfields, respectively. The high Mg content indicates a low rate of dolomitization and dissolving of Mg-bearing minerals. Potassium content increases in aqueous solutions under high temperature until the sylvite precipitates (Mason 1966). Potassium is found as five times as much as seawater ranging between 1656 and 2246 ppm in NR and Lu oilfields, respectively. Shale is a responsible agent of K, particularly where containing illite. Chloride ion makes up over 99% by mass of the anions in the Zubair oilfield water; it concentrated seven times as much as seawater, varying from 122,187 to 140,610 ppm in Lu and Su oilfield, respectively. The high chloride content is attributed to difficulties absorbing on clay or other mineral surfaces. Sulfate is consumed by reduction to form dissolved sulfide by bacterial biogenic processes as well as by sulfate precipitation producing H2S. Sulfates in oil reservoirs have a greater importance, resulting in the possibility it links with other ions such as Sr and Ba composes of sulfate precipitate is insoluble such as celestite and barite. These components lead to reservoir damage as plug pores and thus prevent the fluid passage (Al-Atabi 2009; Awadh et al., 2014; Awadh, 2018; Awadh et al. 2018). The sulfate content is lower than its content in seawater (900 ppm) having range of 260–538 ppm in Lu and Su oilfields, respectively. The bicarbonates content varies between 40 and 450 ppm in Rt and NR oilfields, respectively, which is modtlt coming from the dissolution of carbonate cement. The Na–Ca–chloride is a distinct facies that characterizes the Zubair reservoir in all oilfields (Table 2). The averages of hydrochemical values of brines in each of Zubair oilfields were plotted on Sulin, Schoeller, Piper and stiff diagrams. 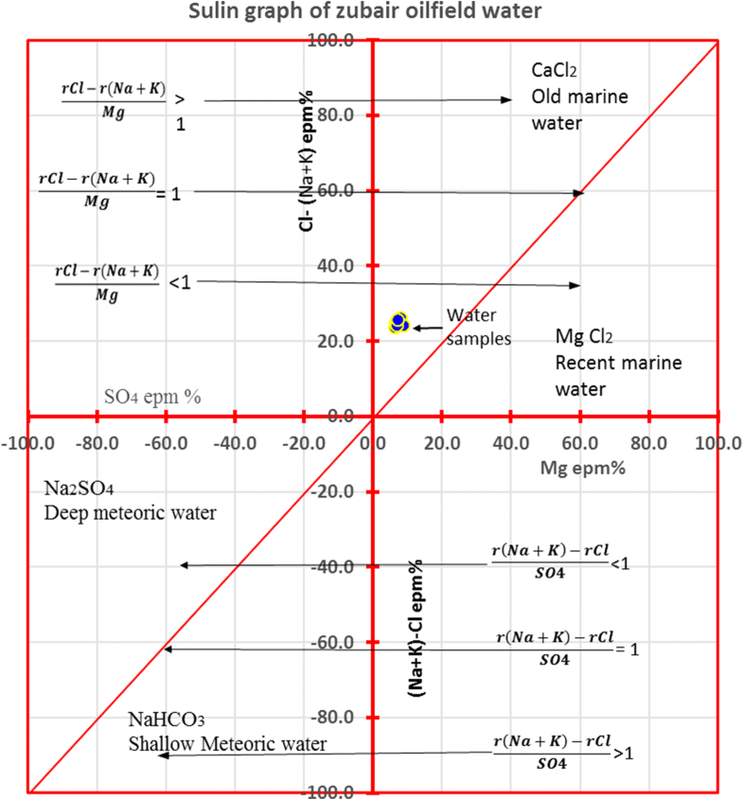 The water type and environmental characteristics based on the ratio (Na + K)/Cl are inserted in Table 3. Accordingly, it was confirmed that the Zubair brines are of chloride–calcium type originated from an old marine water in the confined basin dominated by CaCl2 salts (Fig. 3). 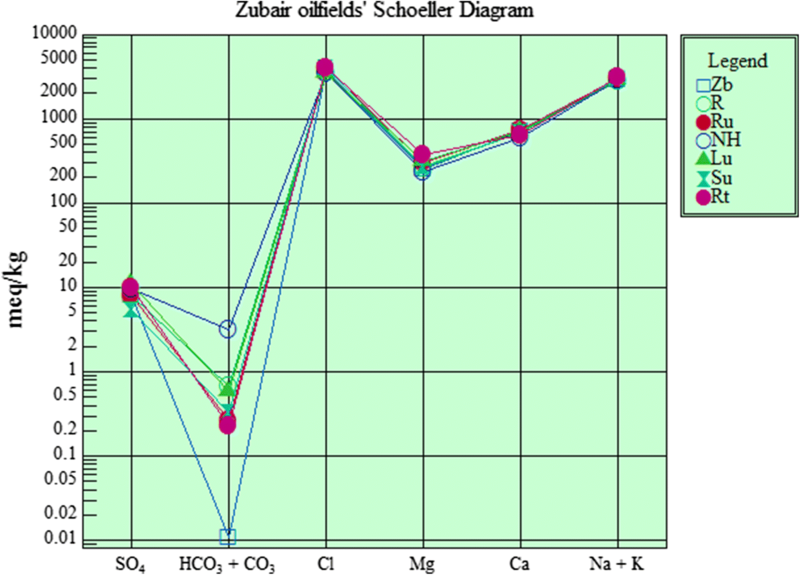 The Zubair brines in each oilfield are of similar composition characterized by chloride group of Na–Cl family (Fig. 4). The Na and Cl are the predominant ions clearly much concentrated than in seawater, while sulfates and bicarbonates seem depleted. 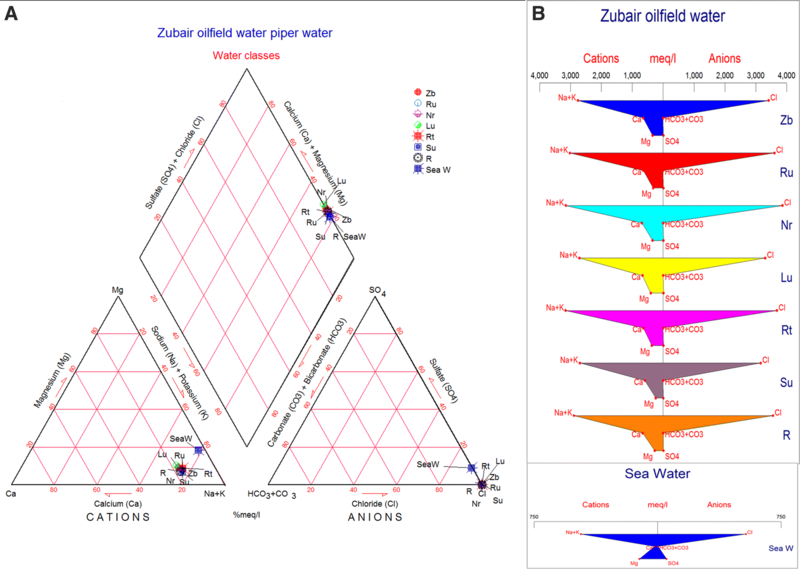 The Zubair brines seem to be hypersaline dominated by Na and Cl ions derived originally from marine water (Fig. 5a, b). The patterns of the Sulin diagram for both of Zubair and seawater are similar in shape while different in quantity (Fig. 5b). When IAP = Ksp, SI = 0 saturated water with equilibrium mineral phase; IAP < Ksp, SI < 0 undersaturated water and mineral phase tends to dissolve; IAP > Ksp, SI > 0 supersaturation water and mineral phase tends to precipitate. The SI values indicate that the Zubair brines are unsaturated (Table 4 and Fig. 6), so ions prefer to remain in liquid phase. Dolomite tends to be saturated in NR and Lu, while in the Lu calcite may be precipitated forming calcareous scale. The potential salts that can be precipitated from the Zubair brines were hypothetically calculated to be as NaCl (76%), CaCl2 (15%), MgCl2 (7.5%), Ca(HCO3)2, CaSO4 and KCl together 1.6%. The SW for Zubair reservoir ranges between 0.59% in Lu and 0.61% in the other oilfields with average 0.60%. The SH ranges between 0.39% in Luhais oilfield and 0.41% in the other oilfields with average 0.39% (Table 1). 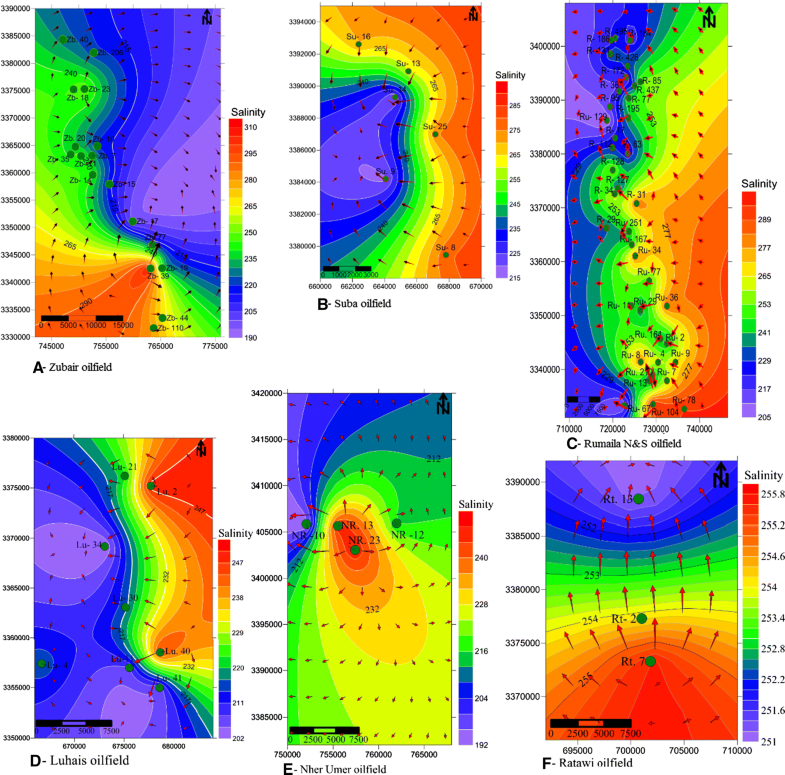 The salinity can give an idea for predicting the direction of brine movement. The high salinity generates high pressure and accordingly brines may move toward low pressure. The brines in all oilfields studied were modeled by isosalinty maps as shown in Fig. 7, where this application had been employed by Awadh et al. 2018. As a result of the rock–water interaction, the salinity increases and the R can also be utilized in the groundwater flow path identification and origin of oilfield brine (Carpenter 1978; Park et al. 2002). The R value in seawater does not change by evaporation up the point when halite starts to precipitate at about roughly (180,000 ppm) of Cl concentration (Walter et al. 2015). In the last stage of evaporation, as Cl precipitates the Br partitions and holds in the solution and precipitates in the K evaporitic halide minerals such as sylvite (KCl) and carnalite (KMgCl3. 6H2O), while in the residual brine, it drops conspicuously to less than 44 in the residual brine (Taberner et al. 2000). Halite dissolution produces a rapid increase in R. In the oilfield brines originated from seawater which have very low concentration of Br, the R is typically 100–300, although they can vary widely (Carpenter 1978; Vengosh and Pankratov 1998). Halite leaching and dissolution adds Na and relative Br having R between one thousand and several thousand (Freeman 2007; Alcala and Custodio 2008). In the Zubair brines, Cl content ranges from 121,200 to 141,650 ppm and Br ranges between 200 and 450 ppm with an average of 131,067 and 360 ppm, respectively (Table 5). The R value of brines greater than that of seawater indicates the addition of chloride to the Zubair brines from another source. This is attributed to the dissolution of chloride from evaporates existing in other formations and then migrating to the Zubair. The formations overlain the Zubair Formation (Middle Cretaceous formation Ahmadi and Nahr Umr) are immature and had very little oil, while the Jurassic formations (Sulaiy, Najmah and Sargelu) are mature formation (Al-Ameri et al. 2011). The hydrocarbon in Zubair oilfield is mainly sourced from the deeper formations of Sargelu, Najmah and Sulaiy and mixed with the oil generated from the Zubair Formation itself (Al-Ameri et al. 2011). The evaporitic formation Gotnia (U. Jurassic) overlain Sulaiy and underlain Sargelu and Najmah (Fig. 2). The Gotnia Formation is of shallow hyper lagoonal basin (Al-Hajeri and Bowden, 2017) forming a regional seal separating the Jurassic and the Cretaceous Formations (Al-Hajeri and Bowden 2017). Many pre-Gotnia Formation faults detected by the seismic section (Fig. 8) may be a pathway of fluid passage (Al-Hajeri and Bowden, 2017). The brines moved upward through faulted zones in the Gotnia Formation whereby Jurassic and Cretaceous faults are connected (Fig. 8). For this reason, the brines passed through the Gotnia Formation and dissolve further halite resulting in the enrichment of chloride ion, and therefore, the R ratio appears high. The hydrocarbons migrate by water movement (Selley and Sonnenberg 2016); this concept confirms that hydrocarbons had been migrated upwards from the source rocks (Sargelu Formation) and trapped in the Zubair reservoir through the fractures and cracks in Gotnia Formation. The ionic abundance in the brine, the Zubair reservoir is arranged as Na > Ca > Mg > K and Cl > SO4 > HCO. Sodium and chloride are predominated ions, where Na, Ca and Cl ions compose of more than 97% of the total TDS; brines are predominated by Na (73.8 epm), Ca (17.5 epm), Mg (7.4 epm) and K (1.28 epm); and anion comprise of Cl (99.7 epm), SO4 (0.23 epm), and HCO3 (0.07 epm). The Na, Cl, Ca and Mg contents are 6.34, 7, 34.3 and 2.59 times greater that seawater, respectively, while SO4 ion is relatively less. The Zubair brines are expressed as unsaturated solutions as the mineral phases are existed in dissolving state with hypothetical salts represented by NaCl (76%), CaCl2 (15%) and MgCl2 (7.5%). The salts Ca(HCO3)2, CaSO4 and KCl are together formed only 1.6%. The Zubair brines are characterized by high salinity exceeding six times seawater, where the highest salinity (257‰) was recorded in the Ru oilfield but the lowest (221‰) was recorded in Lu oilfield, with average 237‰. The Zubair brines in oilfields studied are of marine water developed in a confined basin dominate by CaCl2. The diagenesis processes participated in developing the brine salinity, particularly dissolving halite and anhydrite and moved upwards through the Gotnia Formation located underlain Zubair Formation. This paper is a part of the PhD thesis that has been completed in the Department of geology, College of Science, University of Baghdad. Authors are grateful to the Basrah Oil Company (BOC) for providing us with the oilfield water samples and relevant data. Our appreciation is also sent to the Laboratory staff of the BOC for conducting the analysis of oilfield waters.